The Far West Side of Manhattan is a bit of a no-man’s land. Outside of the Javits Center and some barbecue at Daisy May’s, only storage units, the Intrepid and some boat decks provide reasons for a trip west. Yet in just over 22 months, Manhattan’s first new subway extension since the late 1980s will open, and the 7 line will head to 34th St. and 11th Ave. to an extensive deep cavern station that may one day, if all goes according to plan, serve over 30,000 passengers per hour. The Hudson Yards development will one day be a big destination. The 7 line extension is the MTA’s under-the-radar $2.1 billion megaproject. The route goes through sparsely populated lands without a heavy residential or mixed-used presence as Second Ave. is. It’s a project that was spurred on by the idea of bringing the Olympics to New York but outlived the failed bid for the 2012 Games. 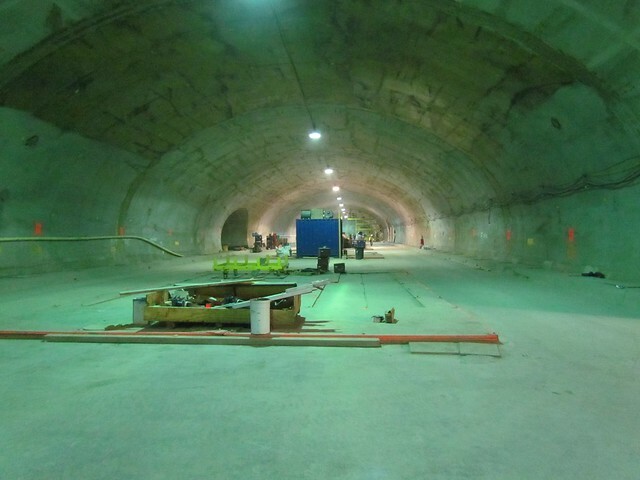 It’s been fully funded, to an extent, by the city, but cost overruns shelved what would have been a very useful station at 41st St. and 10th Ave.
On Friday, I took a tour of the 7 line extension. At 34th St. and 11th Ave., across the street from the Javits Center, the new station is a deep cavern, over 100 feet underground, with a mezzanine that spans over three city blocks. It will have inclined escalators and elevators leading into immense entrances. As the new extension will require six additional trainsets for the 7 line, the new build will have tail tracks that will stretch to 25th St. Horodniceanu said future development could lead to a station near Chelsea Piers or a further extension to 14th St. if the money ever materializes. In fact, such work could have been a part of the current extension had someone wished to fund it. After entering at 34th St., we walked the length of the station and took a stroll through the tunnel connecting the new extension with the current terminal of the 7 train at 41st and 8th Ave. We walked underneath the Lincoln Tunnel, the Port Authority Bus Terminal and active IND tracks at 8th Ave. Still, the lost station was on my mind as I’ve long believed it to be a very costly mistake not to build it. Contractors have flattened out the otherwise steep grade of the tunnel for a stretch at 41st and 10th Ave., and again, if the money materializes, the MTA could build two side platforms there, rectifying this wrong. By the time we reached 8th Ave., the old and the new merged. 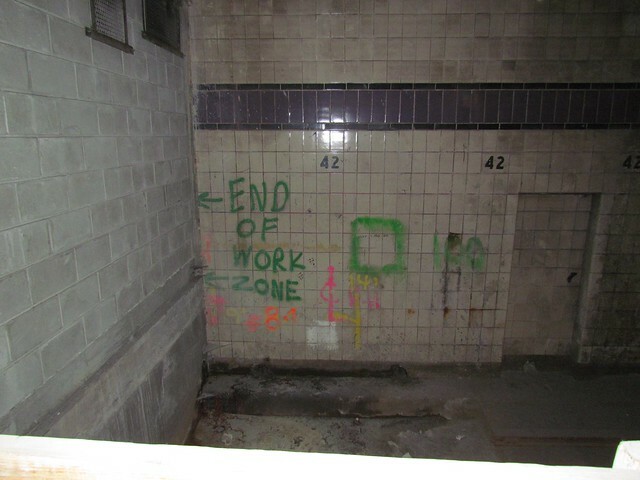 We took a peek at the 7 trains waiting to head to Queens and saw the remnants of the lower level IND platform at 42nd and 8th Ave. This platform, long rumored to have been built to block a westward expansion of the 7 train, served as a set for the movie Ghost and has been bisected by the new construction. Today, it serves as a staging area and temporary rest room for the workers underground. The MTA offers up the 7 line extension of a project that can be built under budget, and while Horodniceanu said it has an “agressive” delivery date of December 31, 2013, they think they can still make it on time. The last contract isn’t due for delivery until June of 2014, and real estate acquisition problems slowed down the overall time frame. But the MTA is offering up substantial bonuses if the contractor can deliver before Mayor Michael Bloomberg’s third term is over. The 7 line extension, omitted station and all, has long been Bloomberg’s pet project, and he wants to ride that train before his days are out. After the jump, a full slideshow of my photos from the tour. Very Nice Photos. I’m looking forward to see what the entrance kiosks will look like (I hope they’re not the bland entrances at South Ferry and the IND 63rd Street Line/IND Archer Avenue Line). So that’s their preparation for a possible 10 Ave station? The tunnel is straight? Well, it’s something. It really grates on me that the MTA describes this as “a project that can be build under budget.” When you eliminate one of just two stations that were supposed to be built, because you don’t have the money, that means you were over budget, not under it. And when your budget is already several times higher than a comparable project in almost any other country…. Yeah it’s pretty ridiculous. I read somewhere that MTA rules about staffing projects like these haven’t changed since the 1960’s Technology has come a long way since then so they are most likely overstaffing the jobs. One thing that bugs me is why in many of these photos does it seem like nothing is being done. One thing that bugs me is why in many of these photos does it seem like nothing is being done. Might have something to do with the fact that I took them with an eye toward sightlines instead of people in my frame. I’ve been down there twice and both times, there’s been plenty of activity. The station definitely does have a WMATA vibe to it — or closer to home on the Flushing Line, the Grand Central platform on steroids. Could you tell how many street access points the mezzanine will have? A three-block-long one makes sense if the MTA plans for entrances at 34th Street and a couple of blocks to the north and/or south, but if they’re simply going to have one mega-access point at 34th funneling passengers down to the mega-mezzanine, then it will end up like all the full-length IND efforts, where passenger usages was concentrated mainly around the stairs/escalators closest to the turnstiles (especially for boarding passengers — If the next train might be about to leave, you’re not going to walk along the mezz to a stairway or escalator further down the platform because that area’s less crowded; you’re going to go down to platform level right away just in-case you notice the doors are about to close). One thing to note. At least this will put an end to the annoying no crosstown service into Times Square during weather related action plans. With tail tracks that long Times Square will likely be THE terminal during mild to medium storms. Also hoping that CBTC signal technology is prepped to be installed in those tunnels when that phase of the contract begins. It would be a complete lack of foresight not to do so. And here’s a big wow to the concept of side platforms being built in the case of 41st and 10th. I thought those days were over with but I guess you gotta do what you gotta do when you fail to do something right the first time. Here’s to double the escalators and elevators hence the dual maintenance. Hopefully they build a suitable crossover/under when the time comes. Is it really necessary? If they decided to put in the new station, they could just widen the box, put in new outside tracks in the widened space, and then route trains over the new tracks while they build up a platform in the middle… They’d need to interrupt service for a few hours while splicing in the new tracks, but whatever; not significantly harder than building a new station with outside tracks on an active line, I think. Your design is significantly more expensive and complicated. If you look at other stations with island platforms, you’ll see that the space between the tracks widens gradually over a distance of several hundred feet before the train actually enters the station, and then tapers again in a similar fashion after the train leaves the station. Both styles have been done in the past — 23rd Street-Eli Avenue (Court Square) and 59th-Lex express were added on as side platforms by the city, but the BMT did add Lawrence Street (Jay St.-Metrotech) as an island platform, because the tracks were far enough apart due to the tunnel bores coming from Borough Hall to DeKalb (though narrow by today’s standards). If the tunnel bores for the 7 are far enough apart at 41st and 10th, the MTA could do an island platform. If they’re side-by-side, or too close to allow for decent-width stairs, escalators and elevators, any new station would be a side platform. I know the topic of why subway construction takes so long and is so expensive was discussed last week, but $2 billion for such a short extension makes my teeth grate…. Probably my favorite SAS post ever, well done. It’s unfortunate that this extension isn’t being given enough credit. Despite the recession, the US population grew by almost 10 percent in the last decade. The vast majority of new development was low-density, auto-dependent sprawl. But basically the only new transit-oriented, high-density neighborhood being built in the country is on the Far West Side of Manhattan. In most of the country “smart growth” means 1.5 parking spaces per unit instead of 2, and modestly-sized vinyl sided homes in the vein of Celebration, Florida. NIMBY opposition basically makes the possibility of a new neighborhood of high-rises a nonstarter in the vast majority of the country. The development slated to rise around 11th Ave is kind of a big deal in that context. This. While a lot of people complain about developer favoritism in this project (and allowing that such favoritism runs rampant in all central planning in the US), this will be 20+ million square feet of newly zoned dense development near the core of a mature city… an achievement basically unique in the US and not having many parallels in the developed world. Assuming New York’s economy ever recovers to the point that the permitted structures get built to their target sizes, which at this point is probably not a foregone conclusion. How much more useful would this extension be if it not only included the stop at 10th Ave, but also included a stop at 23rd Street? What’s the likelihood of that ever happening? That would require an 11-block extension. There are tail tracks for a reason. Love the way bonuses are offered to the contractor just to have it completed before Bloomberg leaves office. Like who cares about quality of work or if the station starts leaking in a few years like South Ferry or if tiles start popping out? As long as Bloomberg can proclaim he got it done. That’s all that counts. Politics at its best. Considering the crappy jobs the contractors do on station rehabs and the leaks all over new South Ferry, Jay-MetroTech and the Atlantic Ave complex, I’m sure this provision will lead to marvelous results. When you use tunneling methods other than cut and cover you are going to spring leaks. 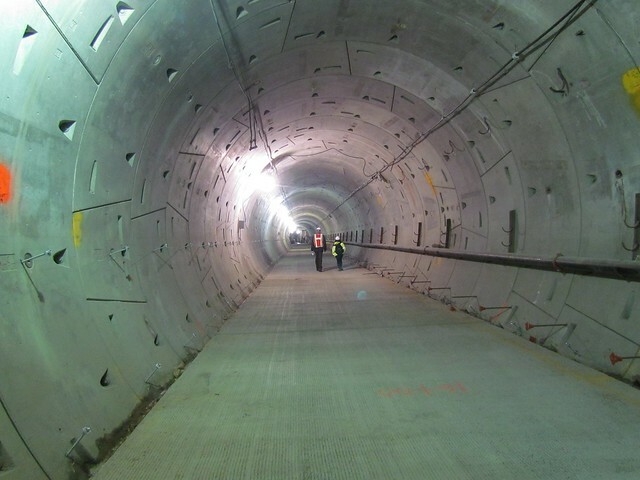 Blasting and tunneling underground while not changing the overhead ground conditions which naturally contain leaks to begin with will cause leaks through new construction. Not if you take proper precautions and build in sufficient waterproofing/drainage. If done right, water is not allowed to build up enough pressure to cause a leak. The cost really makes you wonder about the budget. I was reading an article the other day about the aqueduct by Croton-the amount of water that thing is leaking is pretty amazing. I think they were talking around 600 million to get the leaks patched with one complete replaced area-it was taken out of the budget, last I heard.